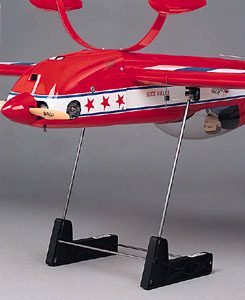 RC Plane CG balancers are available in a number of different designs. We take a look at several types and give opinions on their merits and weak points. 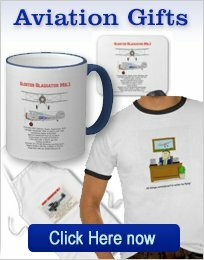 The EZ Balancer RC Plane CG Balancer. I cannot stress the importance of correctly balancing RC airplanes! Failure to accomplish this task can result in total destruction to your brand new plane and cause serious damage to property and injury to spectators. Every kit or instructions should include the position of the center of gravity (CG) or balance point. The completed airframe, ready to fly but without fuel, MUST balance at the specified point. If the CG needs to be calculated or you just want to check the position specified then you can take a look at this page, for how to find that elusive point! 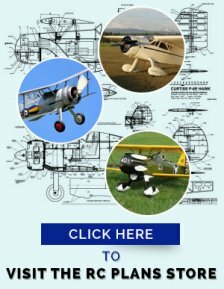 You can use your finger tips to balance the plane and may need the assistance of a helper, especially for the larger and heavier low wing models. In such a case, mark the CG point at the wing tips and you and your helper can lift the model by placing your finger tips at the specified points. The model should be level when lifted. If it is possible to move equipment, such as the battery pack, forward or backward to achieve balance, then you are home free! Ensure that the components cannot move and are secure in their position. If weight must be added, to achieve balance, do not hesitate to do so! It is far better to have a model over weight than out of balance! WW1 radio controlled planes usually have a short nose and can require pounds of lead to balance. As usual, ensure the weight is securely bolted in position. It is better to err on the side of a forward balance point than a rearward one. If the aircraft is nose heavy then the elevator may not be as effective and a flare upon landing may be difficult to achieve. A tail heavy plane however, will be very sensitive to pitch (elevator) and if the balance point is too far back it maybe impossible to fly! The only way to find the ideal balance point for your model is to fly it and observe it's flight characteristics. 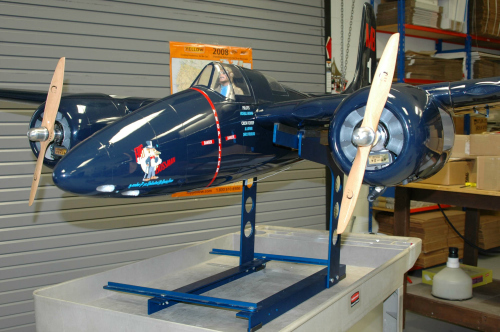 If you are looking for the ultimate aerobatic machine then you will need a more rearward balance point. If forgiving behavior is your goal then a more forward point will give you this. 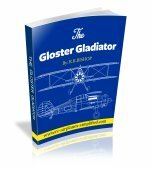 A tip I picked up a few years ago may help you in your quest to find the ideal RC plane CG balancer. 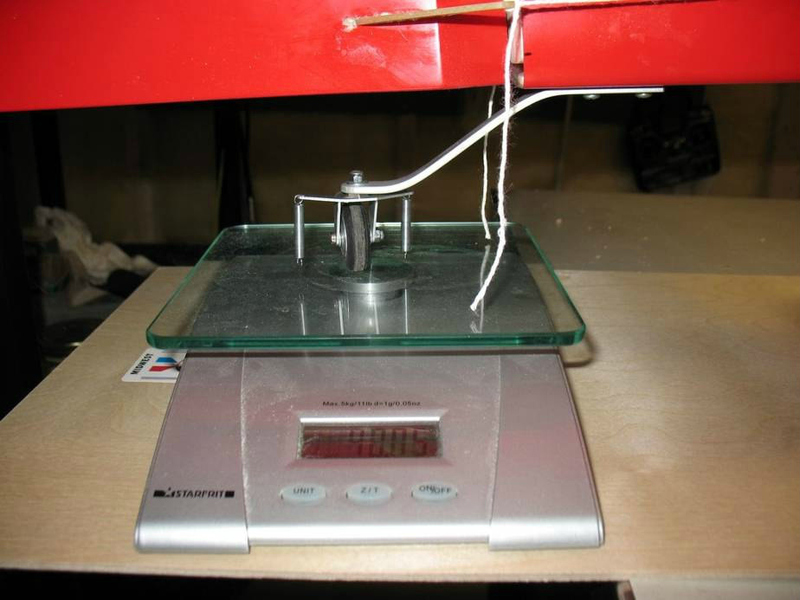 It involves embedding an anchor nut into the airframe, at the balance point. It is then possible to screw in a threaded hook and hang the model from a cord. One advantage of this system is that lateral balance can be checked as well as the usual longitudinal. 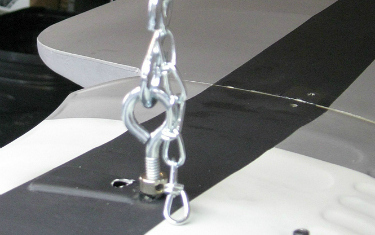 If one wing tip appears to be heavy, then securely attach weight to the opposite tip, to achieve balance. The hardware for this can be found at your local hardware store. Please ensure that the anchor nut is well attached and that the system can take the full weight of the model! 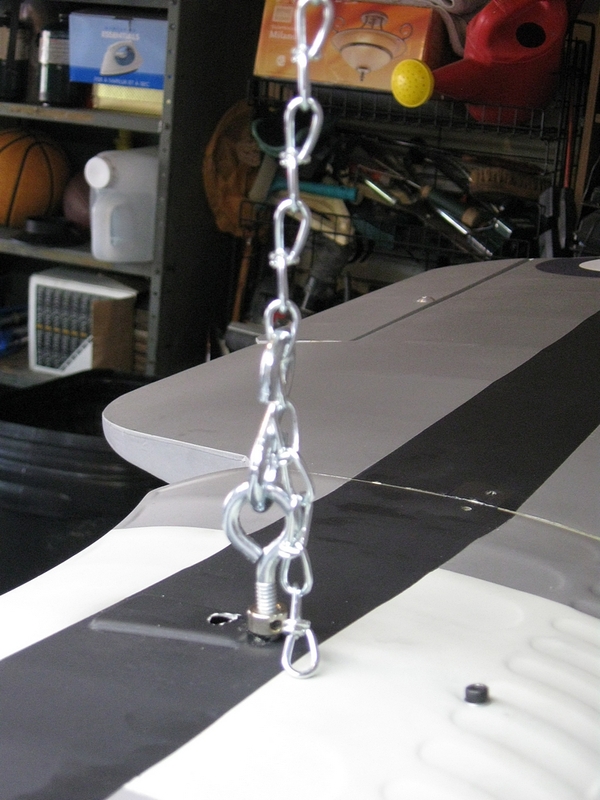 I like to use a # 10 nut and hook and can lift 25 pound radio controlled planes, with this set-up. For high wing planes the nut is securely embedded into the wing center section or fuselage cabin top. (For plug-in wings). Low wing planes are best balance inverted, with the anchor nut placed in the lower fuselage bottom, or the underside of the wing center section. If you are designing your own RC plane or building from plans or an RC airplane kit, then the anchor nut can be built in, prior to covering. 1/5 Scale RC Swordfish, Hanging for Balance. 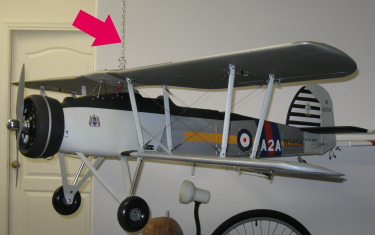 The arrow shows the chain, hanging from the ceiling.The fuselage looks almost level (maybe a touch nose up) I used a small level along the fuselage center line, and added a little weight to the nose. 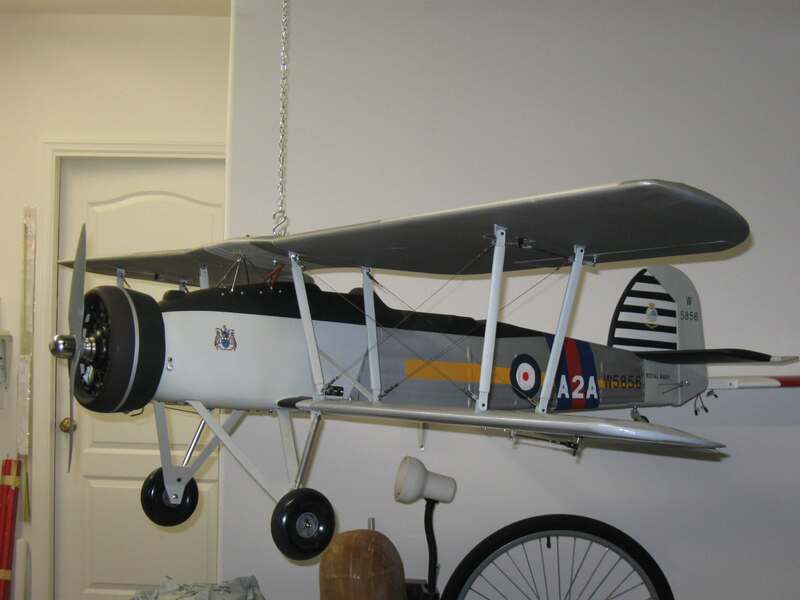 The photos show my 1/5 scale Fairey Swordfish (ARF). The center section of this model is a fiberglass molding. A hole was drilled all the way through for the eye bolt. After balancing, the hole was covered with a patch of Monokote. The photo at left shows the Great Planes C.G. Machine. 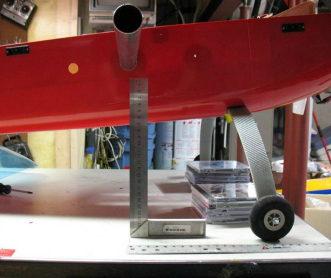 This system can accommodate planes up to 40 pounds, according to Great Planes. For planes over say 10lbs I would strongly recommend using a helper to make things easier! 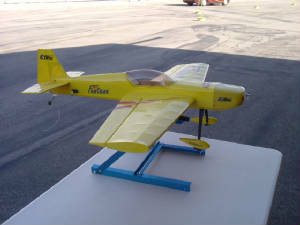 The machine can be adjusted to handle many types of RC airplanes and features ball jointed pads that contact the wing of the model. Please ensure that the area in contact with the pads can support the weight of the model. If necessary thin ply can be used to distribute the load over a larger area. Great Planes C.G. Machine (Center of Gravity) is available from Amazon at a price of $29.98 with FREE shipping. The EZ balancer is available in 2 models. 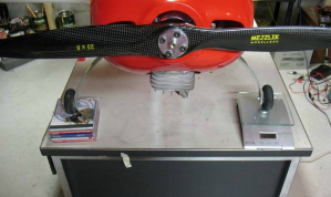 Both types are a heavy duty RC plane CG balancer, constructed of aluminum that is water jet cut and then de-burred and powder coated. This is a high quality item! Both units use the same principle as the Great Planes system, but has substantial vertical members that are much stiffer than the wire ones, that are prone to "vibrating". 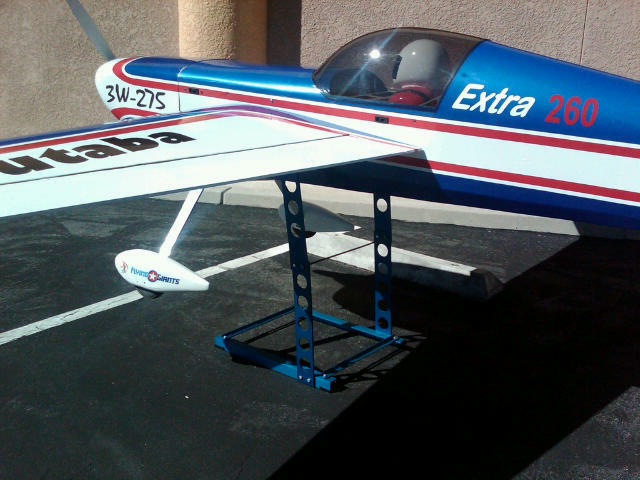 The Balancer II can handle the biggest RC planes up to and including 1/4 scale, with fuselages up to 18" wide. Click here to visit the web site. The balancer comes comes in component form and needs assembly. All hardware and parts are included. EZ Balancer 'Lite' Unassembled and Assembled. 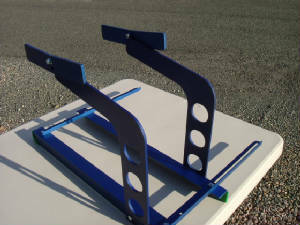 The EZ Balancer 'Lite' can balance planes up to 20 lbs in weight.The cradle width is adjustable. Here is a 20 Lb model on the balancer. Have you ever wondered how full size airplanes are balanced? No they are not suspended from the ceiling or precariously balanced on the wings using a giant version of the Great Planes CG Machine! 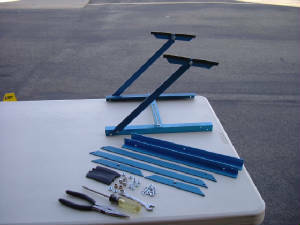 One method is to use 3 load cells, placed under the main landing gear and the nose or tail wheel. Now the total weight can be ascertained and by using a simple formula, the center of gravity (CG) can be found. I came across this method, that was published in the Ottawa Remote Control Club newsletter of February 27 2008,in an artricle by Tom Hastie. The photos below are all from that article. The airplane does not need to leave the ground, either by suspending from the ceiling or balanced on a rig, with the possibility of falling off! Adjusting the position of the balance point is greatly simplified. The scale shown was purchased at Home Depot. It is a Starfrit Digital Food Scale and the cost was $20.00. 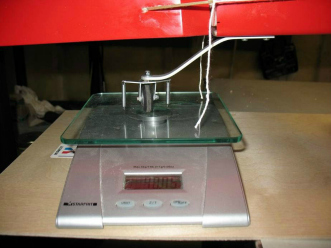 The maximum weight it can measure is 11 lbs with a resolution 0.01 oz. 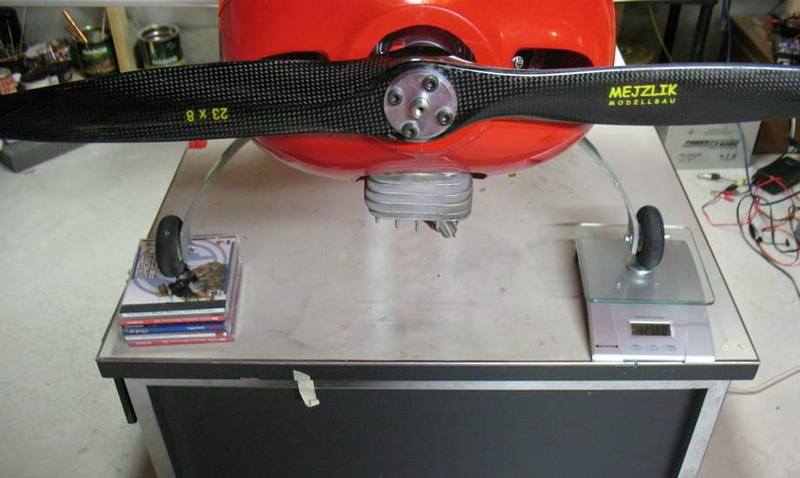 As we are using a 3-point contact for this RC plane cg balancer, the maximum weight we can accommodate is 3 x 11 =33 lbs. The CD cases are used in a pile, and should be the same height as the scale. You can use anything to simulate this, including fabricating something from wood. Digital scale on the left wheel and packing under the right. Place the airplane on a level surface. Digital scale under the tail wheel. 6. 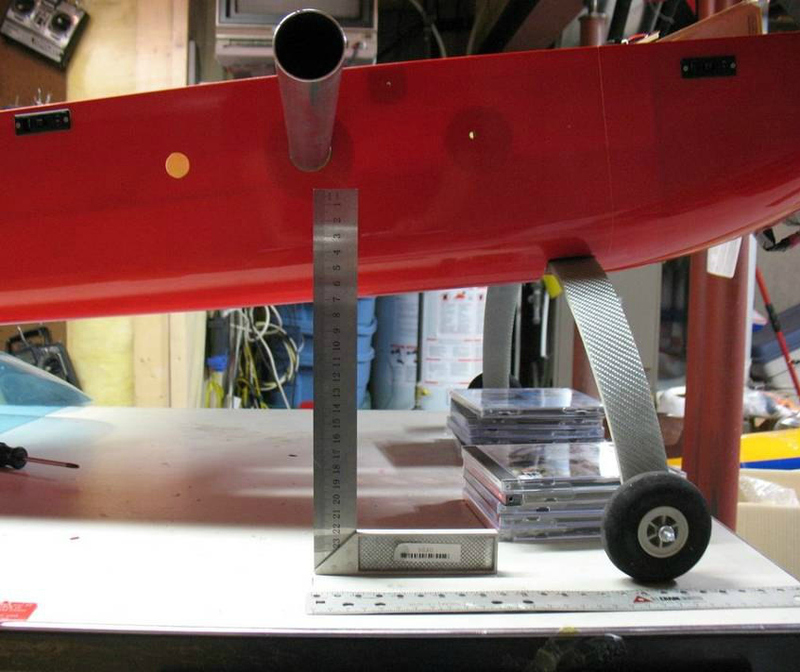 Move the scale to the tail wheel and place the tail CD cases under the main wheel. The weight here was 48.1 oz. That's it! All that is needed now is some simple math. XCG=(Weight tail x D) / WT. Square and tape measure to allow CG marking. The XCG distance can be measured from the main gear back. Notice that the fuselage is not level, during this procedure. As long as the angle of the fuselage is constant, during all measurements, the result will be accurate enough for our purposes. The CD cases ensure that the attitude is constant. In the example. the CG was 9.5" back from the main gear (XCG). The balance point should be at 8.75", according to the plane plans or instructions. Now we can move heavy items (Usually the battery pack) forward or aft to achieve a tail weight of 44.2 oz. Be sure to ensure that the item is securely fixed in position. Now the CG is in the exactly correct position and no weight has been added and the model has not been suspended from the ceiling or subjected to being precariously placed on an RC plane CG balancer! It is a good idea to now repeat the procedure as a final check. If weight must be added to the nose or tail, then remember that the total weight has been increased, so the operation would need to be run again. I recently came across this method and thought it looked very interesting! It uses a chord sling, to suspend the model from the ceiling and there is no restriction on model size or type. The plumb bob indicates the cg and weights can be added or components shifted to achieve the desired balance point.